Digital ERA Leadership: Enduring, Redefined, Augmented - Accelerance - Leadership for Business Performance. Posted on January 12, 2018 at 10:14 am. The arrival of what some people are calling the fourth industrial revolution presents new challenges and new opportunities for leaders, leadership and leadership development. Disruptive technologies like artificial intelligence, robotics, the Internet of Things, autonomous vehicles, 3-D printing, nanotechnology, biotechnology, cryptocurrencies, and quantum computing require both Digital Leadership and Leadership for a Digital World. Digital Leadership is how effectively individuals and organisations harness the transformative power of emerging disruptive technologies as they shape our lives as customers, employees and citizens. Digital Leadership Development raises awareness of how new technologies might sustain or disrupt existing products, markets and networks. It values an ability to anticipate future trends, and knowledge of how different technologies create and capture value. Leadership for a Digital World is about leading in the digital economy, individually and systemically, and is quintessentially human. The leadership challenge is not an intellectual one of knowing which disruption is coming. The challenge is the perennial one of how to get people to embrace the looming change. Leadership Development for a Digital World carries forward enduring qualities like authenticity, purpose, and courage, and redefines important capabilities like innovation, collaboration and transformation. Moreover, the digital era presents an array of augmented leadership skills that facilitate communication between leaders and those they seek to influence, regardless of physical location or when the communication needs to occur. In this article we focus on the three sets of characteristics essential for the development of Leadership in a Digital World: Enduring leadership qualities, Redefined leadership capabilities, and Augmented leadership skills. There are three timeless, universal ways of being that sit at the core of leadership in any era: Purpose, Authenticity and Courage. 1. Purpose, as exemplified by Unilever CEO Paul Polman, is a core theme in the brands of successful digital era leaders like Jack Ma, founder of Alibaba, and Reid Hoffman, co-founder of LinkedIn. These leaders radiate a captivating business purpose that invites the best talent to play a bigger game on a larger field. It isn’t just corporations stung by scandals, greed and corruption that put purpose at the heart of their organisations. CEO’s everywhere expect their organisations to be a force for good, and to serve all their stakeholders, not just those with a financial stake. 2. Authenticity is what psychologists call a compound trait wih four interrelated components that each play a role in being authentic: admitting what you don’t know; being self-aware; living strong values; and listening carefully to those you disagree with. Recent research found authentic leadership connected to an employee’s feelings of inclusion, specifically being “important, meaningful, effectual, and worthwhile” to an organisation (Cottrill, 2014). Not only is Tesla founder, Elon Musk, a visionary and entrepreneur he also cares deeply about the well-being of his 35,000 employees. In response to a safety issue he asked that “every injury be reported directly to me, without exception. I’m meeting with the safety team every week and would like to meet every injured person as soon as they are well, so that I can understand from them exactly what we need to do to make it better. I will then go down to the production line and perform the same task that they perform” (Mejia, 2017). 3. Courage is central to leadership because it faces and embraces what is most difficult. Courage emboldens leaders to confront the fear of the new and the unexpected, and propel them beyond their comfort zones. Courage in the digital era is revealed in the behaviour of entrepreneurs who demonstrate faith in the talents and capabilities of others, take-on difficult conversations, and show initiative and take action. When asked about his decision to leave a successful career and set up an internet bookstore, Jeff Bezos, CEO and founder of Amazon, said “If it failed, fine. I would be very proud of the fact when I’m 80 that I tried. And I also knew that it would always haunt me if I didn’t try. And so that would be a regret, it would be 100 percent chance of regret if I didn’t try and basically a 0 percent chance of regret if I tried and failed. That’s a useful metric for any important life decision”. Leaders continue to rely on their ability to think and act strategically, but in the digital era results are generated from three capabilities: Innovation, Collaboration, and Transformation. 1. Innovation. Continuous innovation, without fear of failure but rather learning from it, is the open secret to capturing the tremendous growth opportunity that digital affords. The digital economy puts an even greater premium on entrepreneurial and innovation skills. Leaders must be pioneers and adventurers, designing and delivering new products, services and especially business models in uncharted seas. They start outside, with a relentless focus on customer experience, and define a digital vision of what’s possible that inspires people – not least the millennial generation – to move forward and take calculated risks. Some would argue that Netflix’s core competency is content delivery, but to catch-up with HBO and stay ahead of Amazon, the company needed to produce original content – otherwise Netflix wouldn’t advance. And in an explosive combination of creativity, cutting-edge technology, and brilliant marketing, Pokémon GO became a global craze in less than a week. 2. Collaboration. As markets become more complex and traditional operating and business models evolve into interdependent and inter-organisational systems leaders must become successful collaborators. Digital era leaders are democratic and socially intelligent. They maintain a more egalitarian approach than earlier leaders needed. Socially intelligent leaders are able to quickly assess the emotions of those around them and adapt their words, tone and gestures accordingly. This has always been key to building relationships of trust, but is vital today as leaders are called on to orchestrate and influence larger groups of people in different settings. To defeat Al Qaeda in Iraq, General Stanley McChrystal and his colleagues discarded a century of conventional wisdom and remade the task force, in the midst of a gruelling war, into a network that combined transparent communication with decentralized decision-making authority. The walls between silos were torn down. Leaders looked at the best practices of the smallest units and found ways to extend them to thousands of people on three continents, using technology to establish a oneness that would have been impossible even a decade or two earlier. The task force became a “team of teams” – faster, flatter, more flexible (McChrystal, 2015). 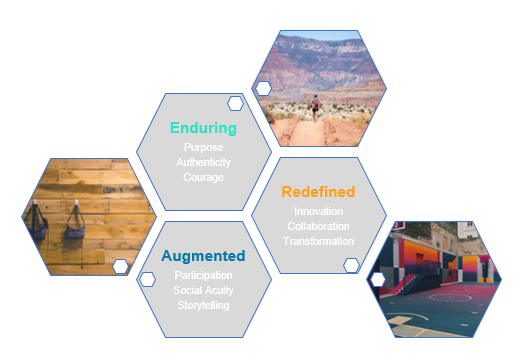 The rapid development and deployment of social technologies has added a digital dimension to leadership which enhances relationships and performance via three key skills: Participation, Social Acuity, and Storytelling. 1. Participation. Leaders must be willing and able to communicate in new ways using new channels and platforms, with a greater emphasis on dialogue and co-creation and less emphasis on command and control. They must be accessible across multiple platforms with a wide range of individuals and groups, and be adept at listening and engaging with transparency, honesty, and authenticity. In the social-media realm, information gets shared and commented on within seconds, and leaders must decide when (and when not) to reply, what messages should be linked to their blogs, when to copy material and mash it up with their own, and what to share with their various communities. Meaning creation in the digital world is a participative process in which leaders play a thoughtful part, as this is the place where acceptance of or resistance to ideas is built (Deiser & Newton, February 2013). 2. Social Acuity. Participating on the main social media platforms does not require leaders to be active sharers, but they can listen and observe. Understanding where, how and what the world communicates is critically important, and there are tremendous opportunities to generate new insights, increase industry knowledge, gain competitive intelligence, stay in tune with customers, and identify potential revenue streams. It is imperative to stay alive to emerging trends and innovations – not just their competitive and marketplace implications – but also what they mean for communications technologies, which are fundamental for creating an agile, responsive organisation. 3. Storytelling. In the digital era the ability to shape a story around an idea is critical. Stories not only paint attractive visions of the future, they also perpetuate shared meanings and grow human connections. Convincing people to believe in something, like using an Uber, stands or falls on the ability to craft compelling stories and turn them into memorable media that make people listen and lean in. Digital era leaders leverage all the social-media activities and opportunities within their reach, skilfully and with a purpose in mind. They also create and sustain a community of followers who advocate the message, and they know and can leverage the organisation’s key – and often informal – influencers to push transferable and shareable stories out into the world. There are three primary colours of leadership: Being, Thinking and Acting. What endures in the digital era are the being aspects of leadership – purpose, authenticity and courage – however mind-blowing the changes in context. The thinking and acting dimensions, however, have to be redefined and augmented to enable a successful transition from analogue to digital era leadership. The digital era will see a continuing shift away from the specification and training of isolated behavioural competencies towards the holistic development of an array of being, thinking and acting abilities, which leaders must marshal if they are to resolve countless, complex people and organisational challenges. As we enter the fourth industrial revolution our leadership development challenge is how to grow authentic, purposeful leaders, who are pioneering, agile and collaborative, and able to harness the transformative power of disruptive technologies to build a better world. Digital transformation is re-defining the leadership agenda everywhere and driving changes in leadership development. Like companies, the specialised function of leadership development faces its own digital disruption (it has its own digital opportunity too!). In 2017 we conducted a research study on “The role of digital technology in executive and leadership development”. We held interviews with heads of leadership and executive development at global companies to find out how they were using, and planning to use, digital technology. We clarified our insights from those interviews and combined them with desk research to identify and explain how digital technology can improve the impact of leadership development. Finally, we drew conclusions. These findings are presented in the below report. Cottrill, K. L. (2014). How authentic leadership and inclusion benefit organizations. Equality, Diversity and Inclusion: an international journal, 275-292. Deiser, R., & Newton, S. (February 2013). Six Social Media Skills Every Leader Needs. McKinsey Quarterly. McChrystal, G. (2015). Team of Teams: New Rules of Engagement for a Complex World. Rock, D. (2009). Your Brain at Work.